New Delhi, March 28: Idli is the most ordered breakfast in Bengaluru, Mumbai and Chennai, finds a study by food delivery app Uber Eats. Idli is often eaten for breakfast along with piping hot sambhar and a variety of chutneys. Want to Lose Weight this Season? Try Some Yummy High-Protein Vegetarian Indian Snacks. 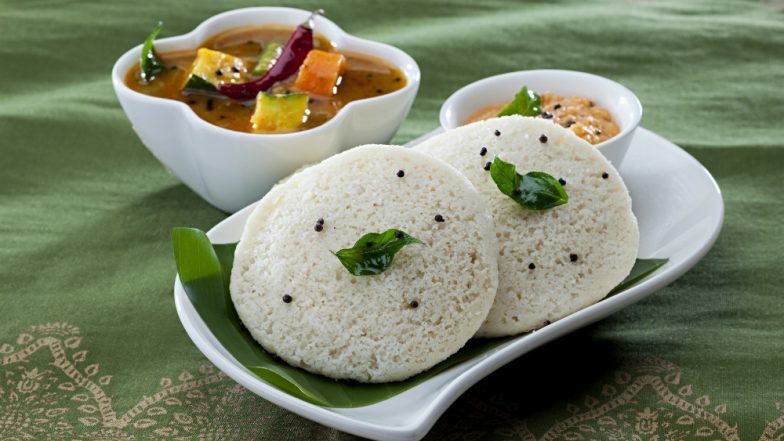 "Idli has been a top breakfast item that consumers love... It appeals to people of varied food preferences and is a popular comfort food for many," Deepak Reddy, Head of Central Operations, Uber Eats India, said in a statement on Thursday. World Idli Day 2018: Twitter Hails the King of Breakfast, Shashi Tharoor Calls it 'Greatest of All Food'. Globally, San Francisco, London and New Jersey were found as the top Idli ordering cities. For the last three years, March 30 has been celebrated as World Idli Day. It is said to be the brainchild of Eniyavan, a popular Idli-only caterer from Chennai. Uber Eats will be running special Idli offers and combos across Idli loving cities on World Idli Day, Reddy said.